Zinfandel has never been one of my favorite grapes, I get bored with the jammy fruits and one-dimensional acidity. That being said, the Mauritson Dry Creek Zinfandel is not your typical Zin. It has more structure. Although it shows a fruity and jammy character, there is a bit more going on, it has back bone. My thoughts were that for sure this would fail in the Vinturi. From seeing the way the Vinturi has torn apart wines, I thought the Dry Creek Zinfandel too would be tore up and left with alcohol and alcohol. Boy, was I wrong. The first wine we tried went through the Vinturi. The wine showed aromas of blackberries, violets, mixed red berry and cocoa. True to the Vinturi’s nature, the aromas were vibrant and explosive. On the palate the wine was dry with higher acidity, smooth tannins and the fruits were present, but not jammy. The wine’s finish was short, but pretty delicious. What surprised me was that out of all three wines, the alcohol was not a prevalent in this wine when compared to the wines from the bottle and the decanter. 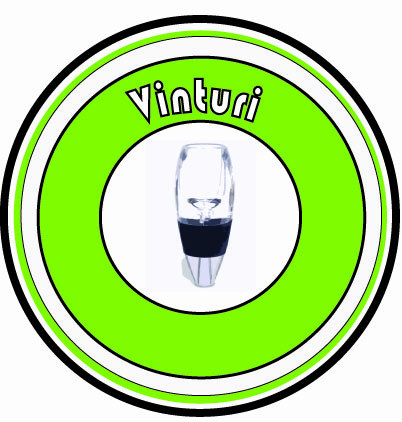 Three of the five judges preferred the Vinturi! The second wine was poured through the decanter. Two judges preferred this wine, however, they also liked the Vinturi. I felt as though the aromas were not as intense as from the Vinturi. There were aromas of flowers but the fruit was not as expressive. On the palate the wine was juicy and the tannins were less noticeable. What we did get more of was oak. The wine’s finish had a woody element that everyone picked up on. Good, bad, not sure, it was just something we all noticed. The last wine was poured straight from the bottle. Although we picked up on the black fruit and berry aromas, it was a bit more closed off than the other wines. On the palate it was similar to the wine from the Vinturi however the fruit was tart and not as juicy and expressive as wine number one. It too had a short finish and nothing really stood out. The Venturi? You mean that plasting with the great design that strips away so much of the tannin and volatile aromatics so that wines taste flat? Oh that one! Yep! That’s the one. The one that is sold in all wine shops and can be found on the floor of TJ Max in the miscellaneous section. The one that claims to improve wines. It has failed all the other challenges for that very reason, stripping the tannins and fruit and leaving alcohol. However, to my surprise and every judge at the table, it actually improved the Zinfandel. Go figure.